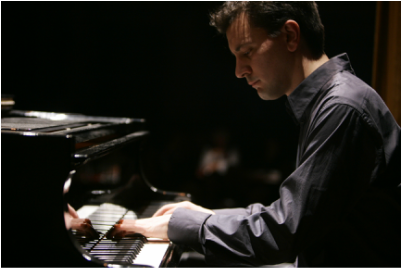 Stefano Travaglini, versatile musician and multi-instrumentalist devotes his attention mainly to the piano and improvised music. He has performed in various contexts, from solo piano to the orchestra, working with various classical and jazz musicians. He studied Piano, Oboe, Bass guitar, Composition and Conducting. He has performed concerts in various countries: Italy, Hungary, Canada, USA, Mexico, Spain, Russia, Germany, Austria, every time performing in the most important cities (Rome, Budapest, Montreal, Ottawa, Toronto, Berlin, Tijuana, Barcelona, St.Peterburg, Los Angeles, San Diego, etc.) and recording radio and TV broadcasts in Toronto. In the summer of 2004, he got his Diploma in Conducting at the Wiener Meisterkurse fur Musik, held at the Conservatoire of Vienna, under the direction of the Spanish Maestro Salvador Mas Conde. During the same year, he gave his personal contribution to the rediscovery of the Italian composer Riccardo Zandonai (1883-1944), by arranging the author's "Soror Dolorosa" for symphonic orchestra. In 2007 got his italian Diploma in Conducting at the Conservatorio of Pesaro and studied also with Colin Metters and Vince Mendoza. He has studied piano from a very young age and he has continued specializing with various maestros, dedicating his particular interest to jazz and all forms of improvised music. Over the years, his passion for improvised music has led him to play with a wide range of musicians and to create a Quintet to perform his compositions. Moreover, in 2004, he was a teacher for Europe Jazz Odyssey Workshop, a project financed by the European Community; in the same year, he played at concerts in Mexico along with the Israel Varela Quartet, and held a seminar at the Technological Institute of Tijuana (Baja California). He set to music the poems of the Nobel Prize candidate A.D.Marianacci, performing them at the Institute of Culture in Wien and Budapest. He recently released a recording of piano improvisations for the label Terre Sommerse with the singer Hungarian F. Halmos: The Hungarian Songbook, a project dedicated to Magyar folk melodies. The work was recently presented in a series of concerts in the United States, culminating at The Hungarian House of Los Angeles, as well as a finalist in the Terem Crossover Competition in St. Petersburg. In summer 2012 he has performed in solo piano in the show Commedia with actor Giorgio Barberio Corsetti at Cantieri dell'Immaginario (L'Aquila, I) right in the heart of the historic center.